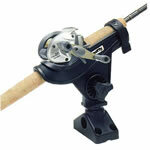 The Scotty Compact Threaded Deck Mount 444 is a low profile way to secure your Scotty Rod Holder to your kayak. The Scotty Compact Threaded Deck Mount 444 secures through the deck of your kayak quickly and easily with the nylon nut provided. 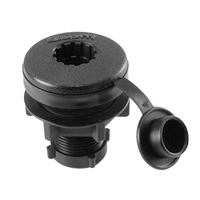 Comes complete with bottom cap and an additional top cap which prevents water from even getting into the mount when you don't have a rod holder in place.